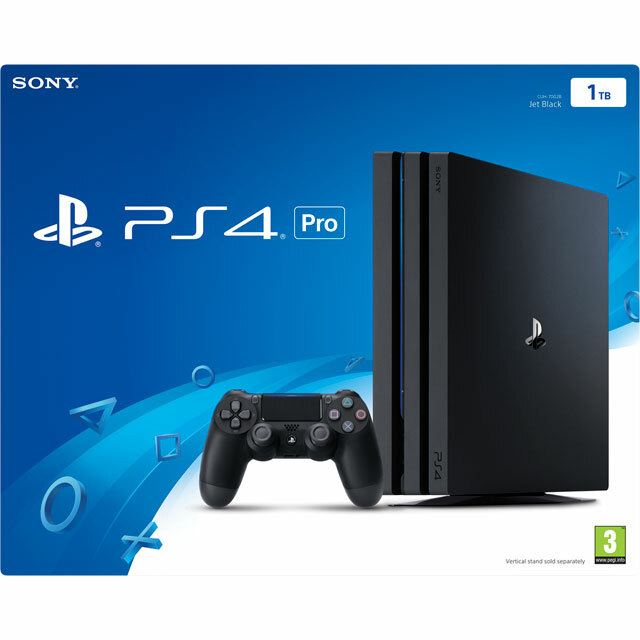 Enjoy endless entertainment with this chassis black PlayStation 4 Pro. It has double the graphics power of a PlayStation 4 so images are super-sharp, for breath-taking landscapes and brilliantly life-like characters. Everything looks incredibly clear too, as 4K gaming and upscaling makes Full HD games burst with detail. The 1TB hard drive stores the equivalent of 60 games, so you’ll always have new challenges to master. And HDR fills every image with vivid colours, for stunning, realistic pictures. This console is also PlayStation VR ready (headset and camera sold separately), so you can play the latest virtual reality games. Don’t forget to pick up a PlayStation Plus subscription card to play all your favourite games online. 4K gaming is here, offering the most spectacular visuals to date. By cramming even more pixels on screen, games are displayed with incredibly sharp and detailed images. Even non-4K games will get an added boost thanks to upscaling technology. All this means you’ll be able to spot even the slightest enemy movement and capitalise to lead your team to victory. Your console is much more than just a place to play games. If you’re in the mood for a movie night, it will play all your favourite Blu-rays, or alternatively you can stream a boxset or catch up with the latest series using Smart TV apps. It supports HDR streaming too, for top quality images. So even when you put down the controller, there’s still plenty of entertainment at hand. Brilliant product, fantastic delivery speed. I use this for my Assassins Creed Odyssey, The last of us, and Black Ops 4. Absolutely brilliant, super fast, and very quiet. The graphics and the colour in all are beautiful on the ps4, I love it ?? Great new what we were getting, the Gamma has a bigger fan.